Inspect your forklifts every day. There are two reasons for doing this: safety and cost savings. Forklifts are heavy machines that lift and move heavy weights. When parts aren’t working properly, it increases the risk of accident and injury. Daily inspections allow you to catch problems in the early stages, making the repairs smaller and less expensive. Identify problems. Some problems are obvious. For example, you notice an oil leak. Or the mast gets stuck and won’t go up or down. Since these problems have already occurred, the next step is to fix them. You also need to spot problems that aren’t yet interfering with the operation of the forklift but could cause a problem. The next step here is to determine what could happen if the problem is ignored and take action to prevent it. Repair problems right away. At a busy warehouse or job site, it can be easy to defer fixing small problems. Perhaps you don’t want the downtime while the forklift is worked on. Maybe you don’t have a needed replacement part. Sometimes you just aren’t sure how to fix it. No matter the reason, fix the problem as soon as possible. Delaying repairs can put workers at risk. It can also cause further damage to the forklift and repairs that cost more. To resolve the issue, first look at the hydraulic fluid to make sure it isn’t too low. If the oil is okay, inspect the forklift chains to see if any sections need to be replaced. Over time, mast sections can become stretched, rusted, cracked, bent twisted or misaligned. Keep an eye out for these small problems that can easily become big ones. A forklift that is hard to maneuver is often a sign of steering problems. It’s also unsafe. The first thing to check is the steering fluid transmission. It it’s low, add more. If it’s thick and gunky, it’s time for a complete change of fluid. Another common problem that can affect steering is worn-out gears. This can be harder to detect, and will require an experienced forklift mechanic to repair. A forklift that won’t start can be annoying and costly as items sit around waiting to be moved. As with a car, first look at the battery. If it still has plenty of charge, move on to the coolant level to check for any problems. Overheating due to lack of coolant or radiator blockage can often prevent starting. If necessary, add coolant and/or clean the radiator. The worst problem with the radiator is corrosion, which usually requires replacing it. Basic maintenance is one of the best ways to prevent forklift problems. It’s also an area where managers often try to cut corners to save money. Yet, cutting corners almost always results in more forklift downtime and higher repair costs. For example, failure to change the oil on a regular basis can lead to engine rebuilds that can cost up to $5,000. Deferred maintenance also increases the risk of breakdowns and accidents. Check tire pressure. Underinflated tires are unsafe and reduce fuel economy. Overinflated tires can lead to blowouts and unwanted downtime. Checking tire pressure on a regular basis will save money and prevent accidents. Change the oil every three months. This simple maintenance task will increase fuel economy, improve forklift performance and prevent combustion problems. It will also extend the life of the engine. Check antifreeze levels. A forklift without antifreeze can overheat or freeze, which can lead to major repairs. Check fluid levels and top off when needed. Inspect the reservoir for leaks. Don’t put off brake repairs. Replacing brake pads and calipers is a fairly easy maintenance task. They should be replaced at the first signs of “softness” in the brakes. Maintenance should always be a planned event. Today’s warehouse management software systems make it easy to set up schedules and adhere to them. They also provide a complete maintenance and repair history of every forklift. There’s another aspect of forklift use that is important to maintain – the training and certification of your operators. 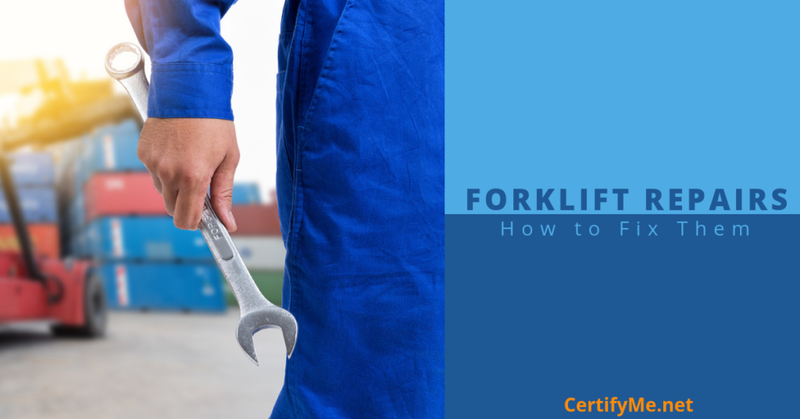 CertifyMe.net provides online professional forklift training that ensures your workers meet OSHA standards. Fast and affordable, one online training class can certify your workers to operate up to seven classes of powered industrial trucks. To save time and money while improving safety, check out CertifyMe.net today.